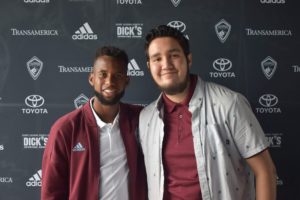 The Rapids world is abuzz with the signing of the US Men’s National Team midfielder, Kellyn Acosta. The dude is excited to don burgundy and help the Rapids with their MLS season, but let’s take a closer look at the road Kellyn has taken to bring him to our humble team. Acosta signed to a homegrown contract in July 2012, a few short weeks before he had turned 17. Due to the rules of the club, though, he wasn’t able to play until the 2013 season. At the time, he was with the FC Dallas U-18 team, where they went 20-3-1 during their 2011-12 season. Once the 2013 season started, he made the bench for the first team for a few games, but didn’t manage to get minutes until August, just after he turned 18. He came on as a sub in an away game against the Seattle Sounders, coming on at the 74th minute. He subbed on for Zach Loyd, and played as a right back. Since then, he continued to be a regular with the first team. He would continue to get appearances in almost every game for the rest of the season, making 13 appearances in 2013. That number would increase to 15 in 2014, again to 21 in 2015, and again to 32 appearances in 2016. That year, FC Dallas was beyond dominant. They walked away with two different pieces of silverware, taking both the Lamar Hunt U.S. Open Cup, as well as the Supporter’s Shield. They set a repeat 1st place in the standings with 60 points, just two more than our own team that year. Though they couldn’t secure the third piece of hardware by winning the MLS Cup, they still made a respectable appearance, losing to Seattle Sounders, the eventual victors, in the Western Conference semifinals. Through his 6 years with Dallas, he made 117 appearances. Compare that to our own Homegrown player Dillon Serna, who signed at a similar time. He has only made 71 appearances in roughly the same timespan. Similarly, Acosta has also done very well with the various US National teams. He first got noticed when he was playing with the U-16s, but has been featured in the U-17, the U-18, the U-20, the U-23, and the senior national teams. With the U-18s, he won the U.S. Soccer Development Academy Central Conference Player of the Year before he even signed his Homegrown contract. He made his debut for the senior national team on January 31st, 2016, in a 3-2 friendly against Iceland. Next September, he started at left back in the 6-0 victory against St. Vincent and the Grenadines, wherein he became the fourth youngest MNT player to earn a World Cup Qualifying debut. The three others? Lynden Gooch, Jordan Morris, and Christian Pulisic. Safe to say, he is amongst good company. Most recently, he was on the squad for the 2017 CONCACAF Gold Cup, where he scored his only international goal against Ghana. The squad would go on to actually win said cup, and he built off of that momentum to be named routinely to the USMNT in their World Cup Qualifying matches… All the way up to the dreaded game against T&T, but we won’t talk about that anymore. It is all eyes to the future, and Acosta is nearly guaranteed to be getting more appearances as we begin planning for an appearance in the 2022 World Cup in Qatar. As for his trade from Dallas to Commerce City, the details of the transaction needs some discussion. FC Dallas sent Acosta, their first round pick in the 2019 SuperDraft, and their 2nd round pick in the same year. The Rapids sent Badji, their 1st round SuperDraft pick, and an international slot through 2020. Badji has recently traveled to Senegal to obtain his green card, so he won’t take up an international slot for Dallas, so the slot is essentially for new signing Aranguiz. Both teams will retain 50% of any future international transfer fees for either player. Acosta is on contract through the remainder of 2018, with club options for 2019 and 2020. The international slot from the Rapids can generally be seen as the slot that Badji took up until recently, and Badji seems to be a fulfilling a need for FC Dallas to have a striker to play alongside Urruti. This is generally seen as a benefit for both teams, as Acosta should be able to make an immediate impact for the Rapids, as he strives for a reboot after riding the bench at FC Dallas the last several games. So how should we, as Rapids fans, feel about the young MNT player coming to our team? Personally, I’m excited to see what he can do. He has had some injuries that has somewhat stalled his playing, and hasn’t been starting for Dallas recently, but I think this team can provide him what he needs; a reboot. He should be able to plug in to this team well, becoming a hopeful dream team alongside Price in the vein of the Azira-Cronin pairing of 2016. With us, he certainly will be considered a starter, and his flexibility as a player will be invaluable for this team as we continue to establish our playing identity. Just as the Rapids hope to start a new era, enter Acosta. He very well could be a key player for this team that has struggled with results and needs a more solid midfield. Here’s to the future, as we all hope Acosta can provide the spark for one heck of a fire.